"Sacrificing Flesh for his Kingdom 轻身为国 (qīng shēn wèi guó)"
The veteran of Wu Kingdom 吴国, Huang Gai served 3 members of the Sun family beginning from Sun Jian 孙坚, then his eldest son Sun Ce 孙策, and finally Sun Quan 孙权. Fiercely loyal, he is best remembered for his sacrificial role in the battle of Red Cliffs 赤壁之战. So prominent was his role, in fact, that his name has become synonymous with the "Trojan Flesh ploy 苦肉计" in the story. More about that the sections below. Character ability: "Trojan Flesh 苦肉 (kǔ ròu)"
During your action phase, you can lose 1 unit of health, and then draw two cards. A marvelous fit! 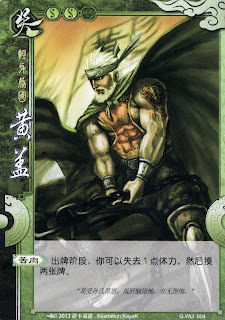 Huang Gai suffered terrible pain and physical abuse, all for the sake of gaining a strategic advantage (ie: deceiving Cao Cao 曹操). In this card game, this effect is reproduced well whereby the additional cards can make a big difference. What if you have 黄盖 and 小乔？ Can you transfer the damage w/ 大桥 and still draw two cards? Not sure exactly what you are asking, but Huang Gai's Trojan Flesh is considered loss of health. Yes, so Huang Gai cannot pass damage using Xiao Qiao ability. Because her ability had said that she can used her ability before she take damage. So if you use Trojan Flesh, then deflect the damage, do you still draw 2 cards? Did you even read any of the comments? Huang Gai causes [loss of health] to himself when activating Trojan Flesh. Xiao Qiao can deflect [damage] that she receives. So obviously you cannot deflect the damage from Trojan Flesh because no damage was done. So what if this guy is partnered with Zhou Tai? You can't lose life that you don't have. When Zhou Tai starts using Refuting Death, his health is at 0. Similarly, Zhou Tai cannot doubt Yu Ji's cards when he has 0 health. What does that mean about Zhang Chun Hua in normal SGS then? Is it possible for her to damage Zhou Tai when he is in his Refuting Death mode? Perhaps I should have worded it better. In situations where a player can choose to activate their own or another's ability which has damage or loss of health as a possible effect, it is implicit that you must enough health to choose to trigger that ability. That does not mean that Zhou Tai cannot continue to lose health normally. In the case of partnering with Huang Gai, it is "Lose one health in order to draw 2 cards (paraphrased)", so it's obvious that Trojan Flesh can't be activated when Zhou Tai/Huang Gai has 0 health (when using Refuting Death). With Yu Ji, it is "Doubt and draw a card if you're right, lose one health if you're wrong (paraphrased)." Since ZT/HG can't lose a health in the case of being wrong, it's implied that he's not allowed to doubt at all. Then with ZCH, her damage is just "reclassified" as loss of health, so she damages ZT just as normal. Some of these questions may be resolved by reading the Chinese description of abilities literally. Even though the translations on this site are quite good, they miss out on some of the finer subtleties that arise when different character's abilities interact because the translations do not carry over the specific terms from Chinese. Actually, I have done a little more research and I believe that the actual explanation for the Zhou Tai not being able to doubt Yu Ji phenomenon is simply that characters on the brink of death cannot doubt Yu Ji when he using Bewilder. I have seen this when he uses Bewilder to try to save someone with a peach (the person on the brink of death whom Yu Ji is trying to save cannot doubt). Since Zhou Tai is on the brink of death in his Refuting Death, this explanation makes sense for this situation as well. The "you can't lose what you don't have" theory still leaves me with questions for other situations. Could Zhou Tai damage Fa Zheng when he is on the brink of death? Is he not allowed to play cards that might damage him if he has does not have a heart card in his hand to give to him afterwards? 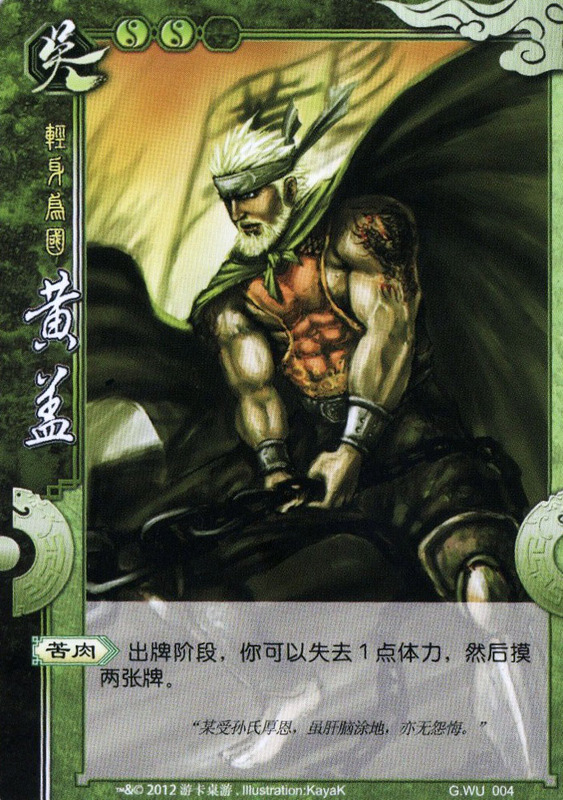 (or if you are using the newer, suckier Fa Zheng, any other hand card to give him?) Can Demigod Zhou Yu use his Searing Heat to place more than one unit of fire damage on one person if he has fewer than three units of health remaining? I could be wrong, but I believe that I once witnessed this occurring on web.sanguosha.com. This seems like it would be a violation of this rule. I most often play using QSanGuoSha. I realize that this is an unofficial program, but it seems to be programmed with my "brink of death characters cannot doubt Yu Ji" theory instead of the more popular "you cannot lose health that you do not have" theory. The program allows you to use Huang Gai's Trojan Flesh with Zhou Tai's Refuting Death. It also allows Demigod Zhou Yu to target one person with multiple units of fire damage if he has the four suits in his hand even if he does not have enough units of health to lose. However, nobody on the brink of death is allowed to doubt Yu Ji. Has anyone witnessed the Huang Gai/Zhou Tai scenario or the Demigod Zhou You scenario on web.sanguosha.com? Does anyone know of an official FAQ with the losing health rules? Actually you are right. I thought about it some more and Brink of Death seems to be the proper, general rule that is followed. I was confused because the original video I saw (which was quite old) showing Yu Ji vs Zhou Tai had commentary explaining it as "losing health you don't have" rather than "brink of death". Okay guys, now what about younger zhugeliang and huangyueying as pair? Wouldn't they make an infinite loop? No. Because Yue Ying only can draw 1 card for each real magic card. Not zhuge liang ability. ...not sure what you meant there, as younger zgl can use black cards as negate and red as flame, both are tool cards. So if he uses any one of those abilities, huang yue ying then immediately draws another card, which of course HAS to be RED or BLACK. KW Huang Yue Ying specifically states that you can't draw another card when using a "transformed" tool card e.g. Younger ZGL's ability: therefore, no loop. That's what the previous person meant by "real magic card". One more thing, Huang Yue Ying does not draw 1 card for Pang Tong "Shackles" ability too. Because it was transformed tool card too. Ah,,, thank you for clearing that up! Also, just askin everybody, which is your favorite character to use, and which is the worst? Well, every characters is the best except some. LiuShan & Fu Ren, discard all cards to heal 1 hp just in case your card werent good enough, so you can give extra turn to another people with heal 1 hp. ZhangFei& Guan Yu, well ,you know the massacre begin ^^ got 1 time I play though, a lot main characters are girl, and GuanYu used Gender Double Swords to draw 1 card everytime aim at the girls. Hehe.. Attaccckk nonstop and too much SHAAA. ._. The others are quite okay. Best Partner for Synergistic Partner in Shu are YueYing&ZhuGeliang(Elder) and HuangZhong&Wei Yan. Well, you know everyone in Wei Forces all overpowered @w@ but the best partners,so far are Xunyu&GuoJia and ZhenJi&GuoJia. YueJin&CaoCao also can be offensive too. LuXun&Shan Xiang , (BEST) you can use AMASS to draw 2 and discard 1 equipment to draw 2 cards which easily to get a lot of cards but can use up to 4 times. BUT, this partner had a fatal weakness, for example RATIONS DEPLETED or all on-hand cards are black. Really, I hate it when all my cards are black so I couldnt do anything at all. Er Zhang(ZZ&ZH)& Lu Meng, can help others defend while you defends. This partners only powerful if they are a lot of friends in WU forces. DaQiao&Zhou Yu, you can Acedia anyone and use Sow Dissension to cause the enemy who in Acedia one damage, Good to use. But I guess anyone who had Sun Shan Xiang with anyone very powerful because she is the Warrior Lady >< If you dont believe me, try to pair her with DaQiao, Sun Quan and others. YuanShao&Tian Feng, you should use this characters if you playing a lot people like 8-12 ppls. Really best to use, here the website to watch the video of le me playing but lose to him though. YuanShao&Jia Xu, (Intimigated Murder) really useful when you used Arrow Shower. Nobody can help them if they die. KongRong&CaiWenJi, (BEST) extra protection for KongRong ability, while if anyone including you got hurt by SHA, you can discard 1 card to flip judgement, and the card that you discard can be given to your friends too ^^ best supporter characters for me . Weakest : Not sure @@ but I think it might be Zhang Jiao and Hua Tuo. 2. Use AMASS to draw 2 and discard 2 cards. The cards you throw away can use Comity too. 3. Hua Tuo's only 1st ability. During his turn, discard 1 card to heal 1 hp of any1 player can be used Comity. However, his second ability cannot be used for Comity because it was regarded as Used The Heal On The Person but not discard. 4. Someone used "Dismantle" on his cards, either equipment or on-hand card. Same if Pang De and Pan Feng destroy his cards. 5. He changed his armor or any equipment. For example, he equipped the Eight Trigrams and then replaced the equipment to Wang Shield. So, in the end, he used Comity to give the Eight Trigrams to any people. 6. Used Blaze and discard 1 card to caused 1 fire damage. The card discarded can be used by Comity too. 7. DiaoChan (Seed of Animosity) ability also the same. 8. Lady Zhou Shi (Impetus for Conflicts) discard 1 equipment to close back 1 character. The same goes to her too. a) Double Gender Swords - if you choose to discard 1 card rather than let her/him to draw 1 card, you can give the card you discard to another people. b)Others people kill your horse by Unicorn Bow or discard 2 of your cards by Frost Blade. c) Rock Cleaving Axe - Force the damage by discard 2 cards. d) Trident Glaive - Discard 1 card to cause extra 1 damage to other people within range.